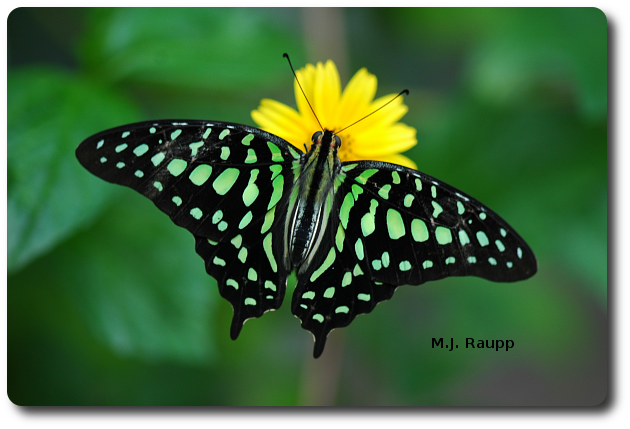 Colors of the tailed jay butterfly are produced by thousands of scalers on its wings. Red and green are colors of the holiday season. The deep green leaves and scarlet bracts of poinsettia have decorated churches and homes in Mexico for centuries while in Europe emerald leaves and bright red berries of holly have symbolized the winter season from the times of the ancient Romans and Celts. The green of leaves is created by the photosynthetic pigment chlorophyll and reds of leaves and berries are produced by another family of pigments called anthocyanins. This is all fine for plants, but how do insects produce the magnificent colors found on their wings and bodies? 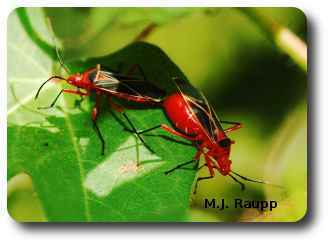 Bright pigments obtained from plants give the cotton stainer its bright red color. For many insects such as the beautiful tailed jay butterfly the iridescent colors on the wings are produced as light is reflected from thousands of shingle-like scales that cover their bodies. Within the scales are several very tiny surfaces aligned to alter light and create specific colors. The spacing of these surfaces causes certain wavelengths of light such as green to be reinforced and reflected while other wavelengths such as reds are absorbed and not seen. Butterflies such as the magnificent Morpho use this mechanism called interference to produce their iridescent colors. Other insects such as the bright red cotton stainer have a different way to generate striking colors. Rows of tiny scales line the wings of this monarch butterfly creating the orange and black characteristics of this species. Like plants many insects rely on pigments for color. Pigments are organic molecules. The chemical bonds of pigments absorb some wavelengths of light allowing others to be reflected. In the case of the scarlet cotton stainer pigments in the exoskeleton of the bug absorb blues and yellows and reflect reds, hence the brilliant vermillion color. Some pigments found in insects contain nitrogen and are synthesized by the insect itself. However, many of the red and yellow pigments known as carotenoids and flavones cannot by synthesized directly by insects. Instead, these pigments originate in plants. As insects eat, they ingest the compounds necessary for the production of color. Their food serves as a source of protective coloration as well as sustenance for the hungry bug. “The Insects: Structure and Function” by R.F. Chapman was used a resource for this Bug of the Week. To learn more about the tailed jay and cotton stainer, please visit the following web sites.